Take a peek behind the scenes at country music’s biggest show. There are 3 ways to tour the Opry. There is a VIP Tour, a Post Show Tour and a Daytime Tour. My kids and I took the daytime tour. Your first job will be to find a parking space. There are lots of options in the Opryland Hotel area. I would try to park near Dave & Buster’s and walk over. This is the closest free parking option. You will purchase your tickets in the box office area and then proceed around the building to wait for your tour time. When it is time for your tour, you will enter a small room to view a short informational video. The video is hosted by Blake Shelton so it really is quite entertaining. The video gives you a brief history of the Grand Ole Opry. After the video, the tour begins at the “Walkway of the Stars”. This is the area where all the Opry stars arrive to perform on the show. This will lead you into Studio A. Here you will stop again for another short video. This video is hosted by stars from the TV show “Nashville”. They give a short history of Studio A. You will be surprised at how many classic programs were filmed in this studio. Did you know that Alan Jackson used to be a mailman at the Opry? Or that Dierks Bentley once worked as a stagehand? You will learn lots of fun trivia as the tour progresses to the backstage area. The first stop is the check in area. All artists performing on the Opry must begin here. There is another short video that highlights different artists being asked to join the Opry. This spot also holds the Grand Ole Opry mailboxes. See if you can find your favorite performers box! As the tour continues, you will get to see inside the dressing rooms and costume areas. All of the dressing rooms are decorated with a different theme. The hallways are lined with photographs and memorabilia. Our tour guide had lots of great stories about the backstage antics through the years. Once you have seen all of the backstage area (including the large waiting area where the stars relax when not performing) you will get to the very best part of the tour. The Opry stage! The tour allows you to walk onto the stage and even stand at the iconic microphone on the historic piece of stage from the Ryman Auditorium. Our guide even offered to let any of the tour participants sing if they wanted to. That’s a once in a lifetime opportunity ya’ll! The tour of the stage area concludes with the chance to get your photo taken. This is an extra charge and you can take your own photo if you prefer. Once your tour is complete, take some time to wander around the area outside the Opry. There are benches and tables to sit and enjoy some people watching and a couple of huge guitars for a truly ‘Nashville’ photo op. If you decide to take the VIP Tour, you will get to see backstage during a live taping of the Opry. That’s just one of the perks of this tour. See the full list at this link. Another tour option is the Post Show Tour. These tours are only done on nights with one Grand Ole Opry performance. This tour has a video component hosted by Darius Rucker. A full description of the Post Show tour can be found at this link. No matter which tour you choose, you are definitely going to learn some new things about the history of Country Music and Nashville. So whether you are a local or a tourist, make plans to see a show and take a tour of the Grand Ole Opry. Hours : Daytime tours are also available seven days a week February through October, though schedules can vary depending upon other Opry House commitments. 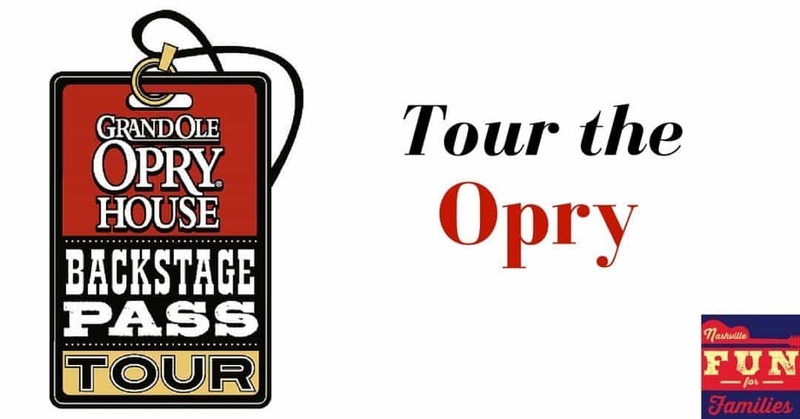 Daytime Tours can be booked up to two weeks in advance online or by calling 1-800-SEE-OPRY. Post-Show and VIP Tours may be booked further in advance. Tours tend to sell out quickly once available, so booking before you arrive is best. Tickets for tours are also available at the Opry House Box Office.